Feel free to expand upon that. In order for the game they have made to flow the way they want it, theu have given elite level proffesional footballers the touch, fitness and passing ability of a bunch of sunday league players. And they call it balance. Awful. Feels like players are running in mud too. It was a bit of a culture shock yesterday trying to sprint with players. Don't get me wrong PES has an annoying habit of your 96 paced winger being caught by the 57 speed Centre Back of the CPU bit you could usually get past a man and speed off. Definitely don't get the feeling I will be seeing much of that in FIFA thus far. But early days for me, attacking I am ok but my defending needs a lot of work. Do English clubs have e-sports players like they have in Germany? Over there it's a big thing! Yep. Don’t know about Palace, but the likes of West Ham and Man City do. First thoughts are that the players don't feel as quick as previous years, but I've only played Single Player on FUT so far, while I try and get a slightly better team. What I've noticed though, is the packs I've been given, and the couple I've bought, definitely aren't always including the cards they should. Definitely had a couple with no Rare's in them, which is a bit annoying. Some players tend to be going for quite decent amounts though for no rhyme or reason. Think it’s all fairly underwhelming so far. At last someone is doing a Palace career mode if anyone is interested. Glad I'm not the only one to tell him he's saying Milivojevic wrong. Who is Milshweyovic?! Just got this on the switch, love it. Mainly play online. Now I’ve found a fluid formation 4231 with 3 CAM’S I’m loving it. Pace isn’t really a thing anymore. It’s more about agility. If you had Mbappe, Neymar, Messi, Salah etc you’d feel the difference. They do need to tune the pace though cos there have been some situations where I’m through on goal and get caught. Bicycle kicks are too over powered all because Ronaldo scores one! Glad it's not just me who's struggled with the lack of pace to the game. Someone at work talked about the Bicycle kicks and how often they seem to happen. Tried to pick up some Gold Player bargains to boost my FUT team. Really not sure how I feel about this game. Any tips on how to get cash on FUT? I've managed to buy 4 players so far but anything I have got from Bronze packs so far is complete crap. I haven't played FUT since 13 or 14. Annoying you can't narrow stadium searches down, lucked out with a Benito Villamarin after about 70 odd pages but got to about 126 and no Ramon Sanchez Pizjuan's. You can't bloody search by club or name or anything. Last edited by Latvian Eagle; 03-10-2018 at 04:58 PM. Had so many Marc Bartra's get outbid. 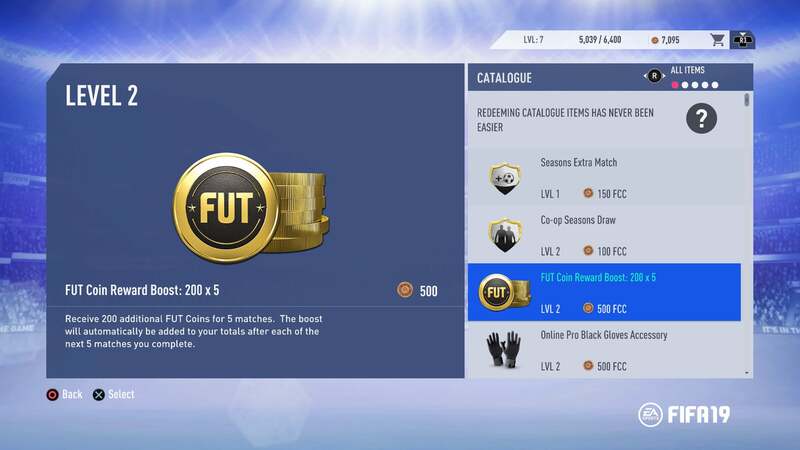 have you got all the coin boosts from the catalogue? Got all of those last night after my post so will see how that gets on. Managed to win my first game this FUT with 3 nice goals and a rage quit.